Are you struggling to make sense of life? Are you feeling lost, anxious, sad, lonely or just “adrift”? It’s okay to say that you are. You’re not alone in these trials. Are you watching a friend or family member struggle through life? Are you afraid that someone you care about might be having suicidal thoughts? It’s okay to admit that you’re at a loss for how to help. The Suicide Prevention Team of Clearfield & Jefferson counties wants to preserve life and bring a fountain of hope to people who have run dry. Life is hard … Hope is here! Check out our events page to find out what’s going on with the Clearfield Jefferson Suicide Prevention Team. 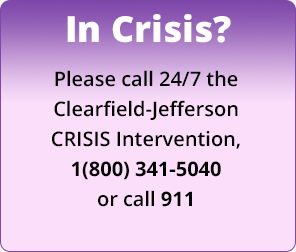 You can play a part in reducing the rate of suicide in Clearfield and Jefferson Counties. Join us as we meet on the 2nd Wednesday of each month to discuss, plan, and implement ideas that may change the lives of our friends, families, and neighbors. Click here to view some great resources to help a friend or loved one. Join the fight to reduce suicide! We would love to have your ideas and enthusiasm at our monthly meetings.